As weather conditions predictably worsened, the National Building Research Organization (NBRO), yesterday (23), issued new red notices to four Districts, warning of potential landslides in those areas and urging the public to evacuate to safe locations. The red notices were issued to Ratnapura, Kegalle, Nuwara Eliya, Kalutara and Galle, warning the public of landslides. The red notice will be valid as long as the rain continues in those districts. In an effort to address the situation, the National Disaster Relief Services Centre (NDRSC) yesterday made available Rs 14.7 million, to 12 District Secretaries, to address the needs of the affected people. State Minister of Irrigation and Water Resources Management, and Disaster Management Palitha Range Bandara announced that compensation of Rs 1 million each will be offered for those who have died while engaged in occupations during the current disaster situation. A sum of Rs 10,000 is to be provided for each house affected by the floods, for the purpose of cleaning. Since the rainfall within the past 24 hours has exceeded 150 milimetres, if the rains continue, the NBRO has requested the public to evacuate to a safe location to avoid the risk of landslides, slope failures, rock falls, toppling soil mounds and ground subsidence. The NBRO also issued a yellow landslide warning to Kandy informing the public to be cautious since the rainfall within the past 24 hours has exceeded 75mm, If the rain continues, they should be watchful for the possibility of landslides, slope failures, rock falls, toppling soil mounds, and ground subsidence. An amber landslide warning was issued to Matale, Badulla, Kurunegala, Colombo (Seethawaka) and Gampaha as the rainfall within the past 24 hours has exceeded 100mm, that if the rains continue to be on alert to the possibility of landslides, slope failures, rock falls, soil mounds toppling and ground subsidence, and therefore to be ready to evacuate to a safe location if the need arises. Addressing a media briefing yesterday (23), Deputy Director of the Disaster Management Centre (DMC) Pradeep Kodippili, noted that the water levels in the Kalu Ganga (River) and Nilwala Ganga had risen causing the possibility of floods. “We requested the people in the area to be vigilant for possible floods. People in the Ratnapura region, especially in the low lying areas must be cautious and be prepared for evacuation if need be. Several spill gates have also been opened. The Udawalawe and Kukuleganga sluice gates were opened as well; therefore those living in the low lying areas in Chilaw and Puttalam should be vigilant,” he said. The DMC noted that two spill gates in the Rajanganaya reservoir were opened yesterday evening. He added that 10 Districts were affected, including 18,542 families and 84,943 persons. He added that the death toll had risen to 11 individuals. Compensation of Rs 100, 000 has been allocated for each family of the victim. “We would advise the public to refrain from going near unprotected water bodies. The public should also heed warnings against lightning, landslides and floods, and thereby take the personal initiative to protect themselves from unnecessary harm. Public living in flood and landslide prone areas are also requested to prepare an emergency bag containing essentials and be ready for evacuation if the need arises. The DMC has set up relief centres and the health services have also been informed of the situation,” he said. Meteorology Department Director (Weather Forecasting) Anusha Warnasooriya told Ceylon Today that the severe weather would continue until 26 May. “The reason for the current severe weather is wind convergence in the atmosphere near Sri Lanka and wind turbulences in several places in the Indian Ocean. We can’t predict whether this condition will prevail further or not. However, within a few days, the South-Western Monsoon will be fully established and strong speedy winds will be observed. Districts in the Western and Southern Provinces will be affected the most and there may be influences to the Central Province. Districts like Puttalam and Kurunegala will receive relatively mild effects,” she explained. Speaking to Ceylon Today, Military Spokesperson Brigadier Sumith Atapattu added that troops on standby have been increased to 5,000 all around the island in order to assist with potential rescue operations and evacuation missions. 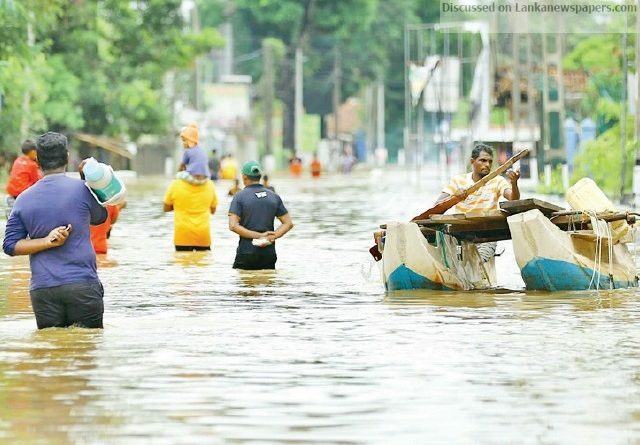 The Sri Lanka Navy, continuing with its flood relief activities, has currently deployed 45 relief teams along with 43 dinghies to step up their relief missions further in the Southern, Western, Sabaragamuwa and North-Western Provinces as of now. Displaced communities in the Ratnapura, Ayagama, Malwana and Dompe areas were rescued and transferred to safe locations by the Navy Rapid Response Rescue and Relief Unit (4RU). Meanwhile, a Naval relief team assisted in the conduct of a funeral, hampered by rising floods in the locality of Molkawa in Mathugama, by transferring the coffin to a dinghy. Meanwhile, traffic in the Biyagama-Kelaniya Bridge has been restricted to one lane due to the erosion of the river bank on either side of the Bridge, Director General of the Road Development Authority (RDA) D.K. Rohitha Swarna said. Speaking to Ceylon Today, he noted that heavy rains experienced in the area had caused the erosion that had resulted in the road leading up to the Bridge to break away. “So far there is no requirement to erect a temporary bridge. Traffic has been restricted to one lane and the motorists have been requested to be cautious. We are observing the situation and a team of engineers are looking into it,” he said. The RDA went on to note that several roads in Colombo had been inundated due to the incessant rains thereby causing traffic congestions. The Police requested all motorists to be cautious and to reduce speed to avoid skidding and other accidents. Kalutara District Secretary U.D.C. Jayalal yesterday advised those living close to or on the banks of the Kalu Ganga to be vigilant of its rising water level, as the rains received by the upcountry areas and the Ratnapura District had gone up although by last afternoon there had been a reduction in the rain received in the Kalutara District. He warned that there was a severe flood risk for areas in Millaniya, Madurawela, Dodangoda and Ingiriya. Jayalal pointed out that by last afternoon the water levels in such areas as Bulathsinhala, Walallavita and Palindanuwara had begun to recede. He added that by yesterday afternoon one person had died from the aggravating disaster situation in the Kalutara District. “Due to the adverse weather conditions, out of the 14 Divisional Secretariats in the District, 12 have been affected. However, in order to provide relief, the District Secretary’s Office, the Disaster Relief Centre, the Police and the Tri-Forces are working round the clock,” he said. In the Kalutara District alone, from 938 families 3,375 persons have been affected by this disaster situation. Through landslides or floods, three houses have been completely damaged, while another 165 houses have been partially damaged. Meanwhile, in five protection centres, around 143 persons from 41 families have been provided with shelter. He added that the Government has provided cooked meals and money to cater to their essential needs. Minister of Home Affairs, Vajira Abeywardene claimed that the hotline of 1902 has been activated for the public to report any cases of emergency following the disastrous situation that has been brought forth due to the adverse weather conditions countrywide. The Minister announced that all cases of disasters could be informed to his Ministry which will coordinate matters with the relevant units through the aforementioned telephone line. The Minister has also directed his Ministry officials to provide swift relief to all those who have been affected by the current adverse weather condition. State Minister of Irrigation and Water Resources Management Palitha Range Bandara yesterday (23) said in the Parliament that steps had been taken to send dry rations to those who were affected by the heavy rainfall and floods. Bandara, further said that boats have been given to all the Districts by yesterday. For the Ratnapura District, 66 canoes had been sent. Apart from Ratnapura, canoes and engines have been sent to the Colombo, Kegalle, Puttalam and Kurunegala Districts, he added. “The Government has established a mechanism to deal with this weather situation. We give updates about the weather from time to time to the people. Warnings have been already issued. We have a plan to deal with this,” the State Minister noted. Furthermore, the State Minister said that cheques of Rs 10,000 each would be given to the house owners for now. Funds for that have been allocated. To clean wells, 20 motors have been sent the Puttalam Distrct, he said.